Roasted Brussels Sprouts | Time to Cook! I love these shaved brussels sprouts (I found them raw in a bag at Trader Joe’s and I think Safeway now carries them too). This would be a lot of work to cut these delicate sprouts up so thinly, so I love that the prep work is already done for you. 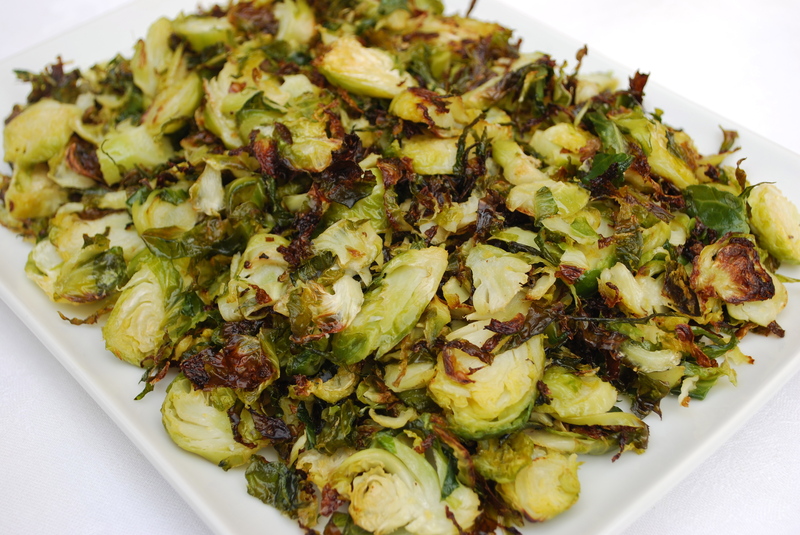 I should note that I hated brussels sprouts growing up (I think my Mom boiled them and added no seasoning) … but prepared this way (shaved and roasted), they are so tasty, delicate, salty and crispy — they are sure to turn any brussels sprout sceptic into an enthusiast. Roasted Brussels Sprouts Ingredients: Two (10 ounce) bags of shaved brussels sprouts 4 tablespoons of extra virgin olive oil 1/2 teaspoon kosher salt 1/4 teaspoon freshly ground pepper Directions: Spread the brussels sprouts onto 2 rimmed baking sheets, so they have plenty of room to roast (if they are too crowded, they will steam and stay too moist). Toss with the olive oil, salt and pepper. Bake at 350 degrees for 25 minutes, or until nicely browned and a bit crispy. Season to taste with more salt. Serve warm or at room temperature. Serves 4-6. The Brussels sprouts are outstanding. Easy and delicious. And, most important, my 3.5 year old loves them! !